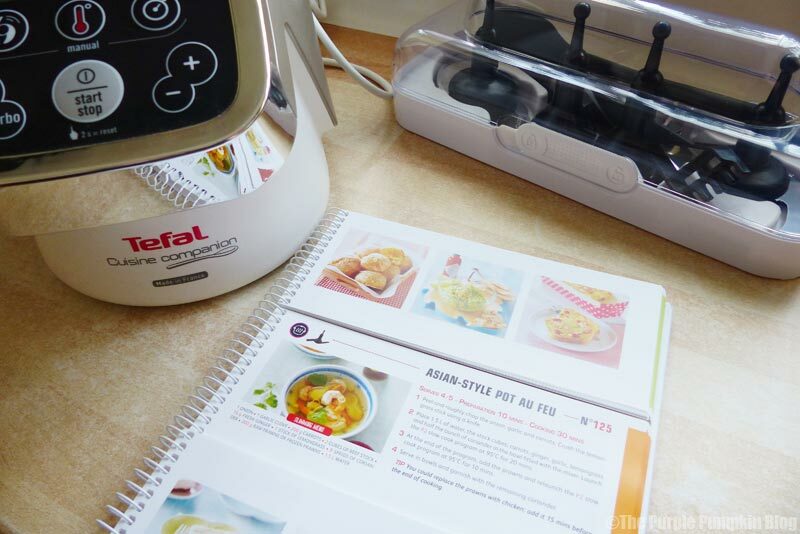 I know I’ve established on my blog before that we love a kitchen gadget, so when Tefal got back in touch with me to review the Cuisine Companion, I immediately said yes. I’m all for making things a bit easier and/or quicker in the kitchen. The only trouble with gadgets is that often they are bought on a whim (I’m looking at you, Ideal Home Exhibition and Shopping Channels!) where they appear to be amazing and life changing, but after just one or two uses, they don’t perform quite like they claimed to be, and end up gathering dust in the back of the cupboards, never to see the light of day again. In the past we’ve bought a Bread Maker (the one we had was awful, and we couldn’t get the attachments out properly, ruining the bread! ), and a Juicer (from the IHE) that leaked EVERYWHERE, that have both been thrown out after a few uses. Yes thrown out – waste of money! These are the current kitchen gadgets that get used in our house: Smoothie Maker (daily), Mixer (for cakes etc, seasonally), Tefal OptiGrill (weekly), Food Processor/Blender (occasionally, usually when I’m catering for a lot of family/friends), Slow Cooker (usually in autumn/winter), Soup Maker (ditto), Hand Blender (not so much now we have a soup maker). We also have a Steamer – but the kind that sits on the gas hob, rather that an electrical one. Most of these are packed away, since counter space is a premium in our kitchen, and because some only get used seasonally. 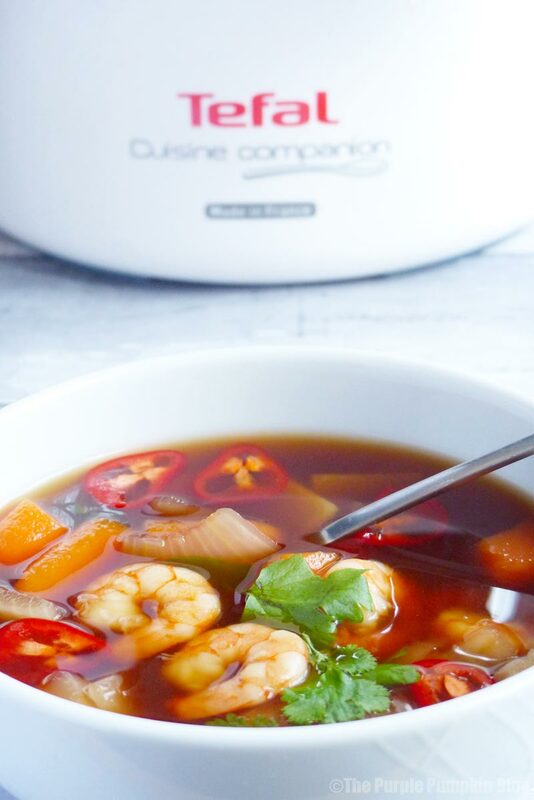 Now, The Cuisine Companion claims to replace up to ten different appliances in the kitchen and is perfect for chopping, whipping, mixing, kneading, cooking, steaming, blending, stirring, emulsifying, whisking, searing, crushing, milling and precise heating. There are 6 automatic programmes and a manual mode, with adjustable cooking temperatures from 30º to 130ºC, and a time range of 5 seconds to 2 hours. A multi-functional cooking food processor with 6 automatic programs for home-made sauces, soups, stews, steam dishes, pastries and desserts. Multiple cooking modes: for every kind of cooking, from the softest to the highest thanks to its adjustable cooking temperature from 30 to 130°C. A wide variety of mixing results: From delicate to ultra fast mixing thanks to the 12 speeds and to the Pulse & Turbo keys. 1 stainless steel steam basket. Being honest and upfront is always important to me, and my blog, so I will disclaim right now that we haven’t used this as much as we potentially could have. For a couple of reasons – when it arrived, I wasn’t in the best place mentally. It meant that the Cuisine Companion sat in the box for a couple of weeks. It then got taken out so I could make a start on photographs for this blog post, and then found a “home” in our kitchen, where it sat for another couple of weeks. Why? Because I was still in a bad place with personal issues, and cooking anything for my family was actually the last thing on my mind (awful, I know). It’s why you’ve not seen many recipes on my blog recently. We then perused the recipe book for something to try out and so finally the gadget was used! Hallelujah! Now that it’s been used a few times, we’re ready to start using it for its intended purpose – to be a companion in the kitchen, and to remove some of the existing gadgets we have that could now be redundant. I would add here, that not all the recipes in the book are cooked completely in the machine – some are preparation only, with additional cooking in the oven. Or by finishing setting in the fridge or freezer. But that said, there are some really interesting looking recipes in the book, that I know we are keen to try out. Also at the front of the book is a oven temperature conversion table; tips for getting organised in the kitchen; basic ingredients it recommends you should try to have in the store cupboards, and fridge; menu ideas for things like Christmas, vegetarians, and gluten-free (among others); and some basic recipes including pastry, pizza dough, fresh pasta, sauces, and stocks. The recipes are split into three flip page sections – starters, mains, and dessert (100 of each), with an index at the start of each section. Each recipe has icons in the top left showing you the automatic setting you need to use, as well as the accessories that will be required. The ingredients are listed, as are the number of servings, prep time, and cooking time. 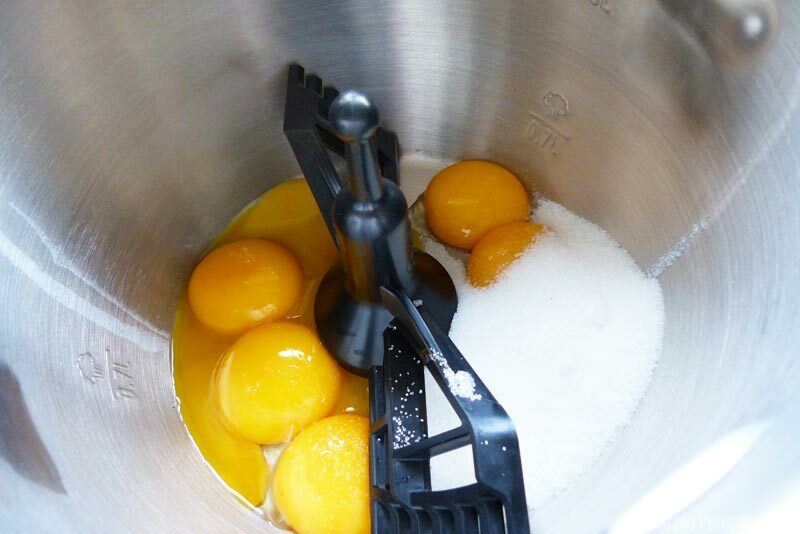 However, on one of the recipes we chose, there were some errors, and we had to use good old fashion common sense. 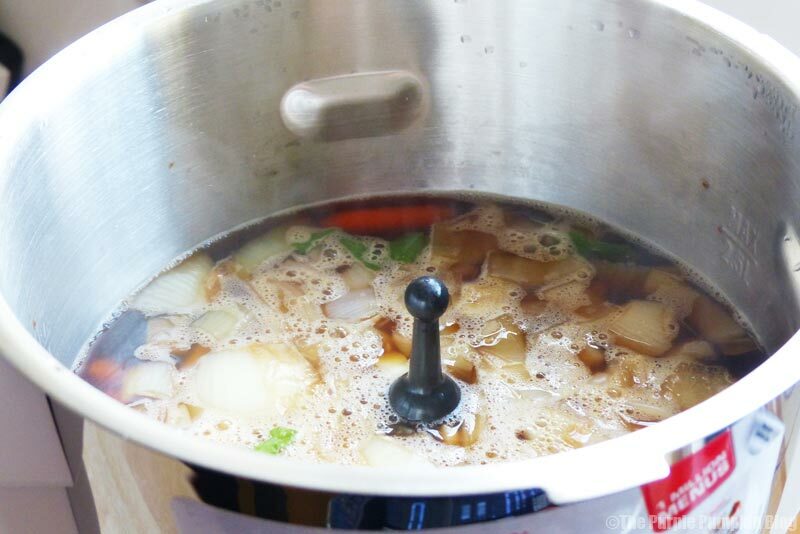 This particular recipe was for Asian-Style Pot Au Feu, and it stated ginger as an ingredient. The recipe didn’t tell us how to prep the ginger (although it did for the other ingredients), so we just sliced it. Next time around I would actually crush it, to release more flavour.The recipe also called for chopped onions – but didn’t say when to add them, so again, common sense told us to put them in with the other ingredients. So my recommendation here? Read the recipe fully before you start! This may well have been an editing oversight, so I hope not to find too many other errors as we cook our way through the book. Once all the ingredients were in, the machine was set to the slow cook programme at 95°C for 20 minutes. It meant we could go off and do something else, and not have to watch the pot, as it were. Prawns needed to be added at the end of the cooking time, (there is a tip on the recipe that suggests using chicken instead of prawns) and cooked for a further 10 minutes. Then the soup was ready to eat. I’ll be sharing the recipe in another post, as I decided that it needs a few tweaks! 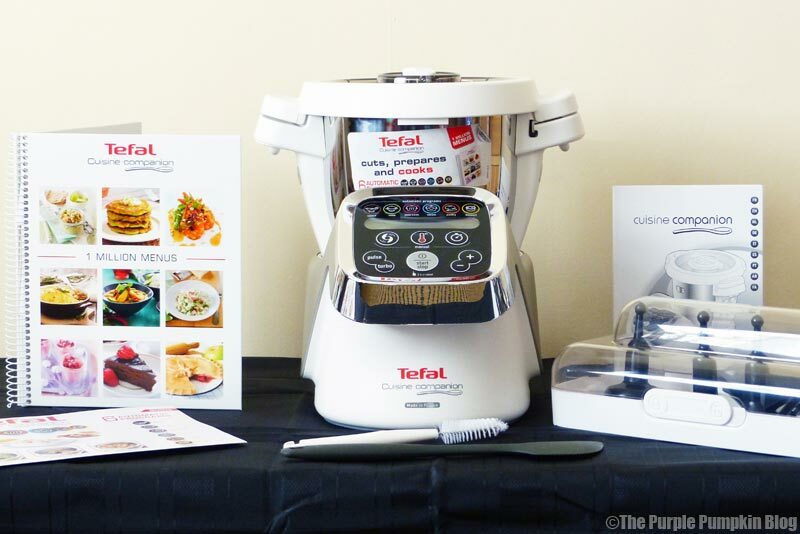 But here is the finished Asian-Style Pot Au Feu that we made with the Tefal Cuisine Companion, below. 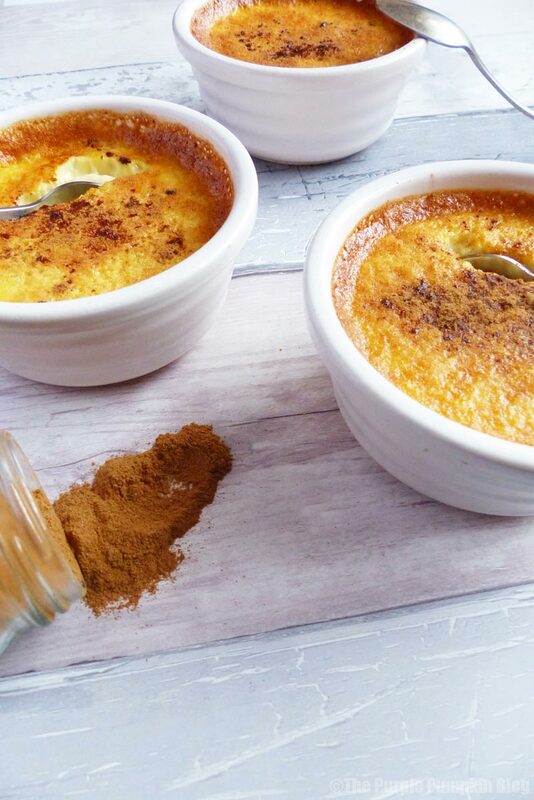 We also made a delicious dessert called Natillas, which is pretty much an egg custard. The custard is made in the machine, and then poured into ramekins to set completely in a bain-mari (water bath) in the oven. Only a second recipe in, and already confident to start switching things! The recipe called for semi-skimmed milk – we only buy skimmed milk, and the shops were closed as it was late Sunday afternoon. So we reduced the quantity of milk, and added some melted butter to replace the fat that would be missing in skimmed milk. We also doubled up the vanilla, because vanilla is an amazing dessert flavour. And good job too as it wasn’t overpowering – any less and we might not have even tasted it! Our oven is a bit crap, so we had to increase the cooking time, but all in all, a tasty, quick dessert, that I would definitely make again. Recipe in another post soon! The recipe book is very handy, and a great way to ease yourself into using the Cuisine Companion, as well as the opportunity to try and use ingredients that are not so familiar, like rabbit, and beef cheek. Once you master a few recipes, and figure out how it works, I think it’ll be easy to step into creating your own recipes, and using the manual mode, rather than the automatic programmes. It’s also very handy to be able to leave recipe preparing/cooking, whilst you are off doing other tasks in the kitchen. The machines looks good – almost space age in appearance. It doesn’t take up too much space on the kitchen counter, and the container with sharp accessories can be tucked in the cupboard easily. The security lock on the container is a great safety feature. We like that it can potentially replace several existing gadgets in the kitchen, but I would use the Companion for a little while longer yet, before relegating my existing food mixer and food processor. I want to make sure it can fully do what I want it to. I know it wouldn’t completely replace one existing gadget though, and that is our slow cooker. The longest time setting on the Cuisine Companion is 2 hours, so it’s not a true slow cooker. Similarly if you have a bread maker already, which cooks the bread inside it, and use it a lot, this wouldn’t replace that, as you only prepare the dough in the Companion. Now for the big one – is it worth the cost? This has to be a “bit of both answer” to be honest. If we were just setting up house, then yes – it potentially saves on purchasing other gadgets that do the same job, and we all know how those costs can mount up. This would have been a great thing to add to our wedding gift list. There is the time saving element to the price, as you can leave the machine to do its thing whilst you go off and do something else, and we all know how time poor we are these days. It is an expensive bit of kit, and I would have to carefully consider everything if I did pay for this out of pocket, at nearly £700 it is an investment, and would have to get a lot of use to make it feel like it was good value for money. As time goes by, I intend to add to this review – I want to see how often we really do use the machine, how many meals we can use it for, and if it really does replace our existing, aforementioned gadgets. My husband keeps mentioning that he wants to have a go at making bread, and my son wants to try out the pizza dough. Me? Well, I want to try as many of the different recipes as I can! Some that stand out are: Profiteroles (I have never made choux pastry before), Red Berry Jam (it uses gelatine, and less sugar), and Rabbit in Beer (I’ve eaten rabbit once, but never cooked it). I then want to try some of my own recipes for family favourites – like vegetable soup, bolognaise, chicken curries, etc., to see how I get on with those. I’d also want to see how good it is for whipping up cupcake batter and butter cream, so I can potentially wave bye-bye to my current mixer. 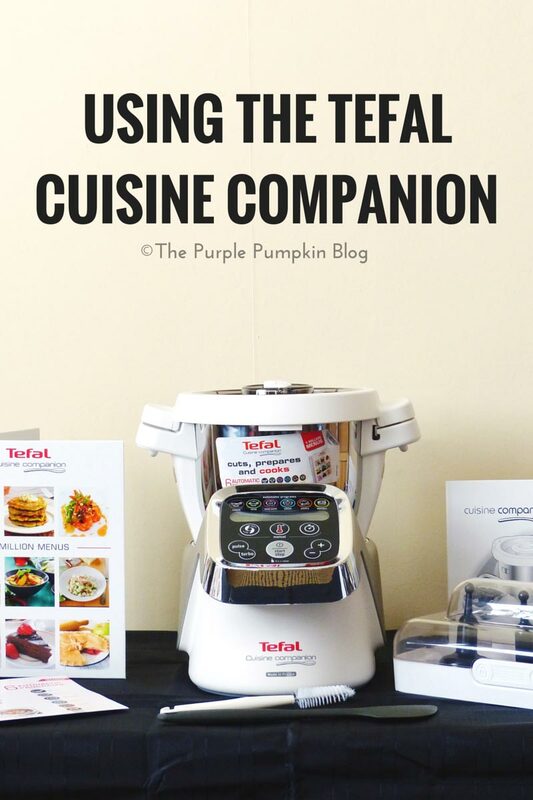 What do you think of the Tefal Cuisine Companion? Is this a gadget you could see yourself using? 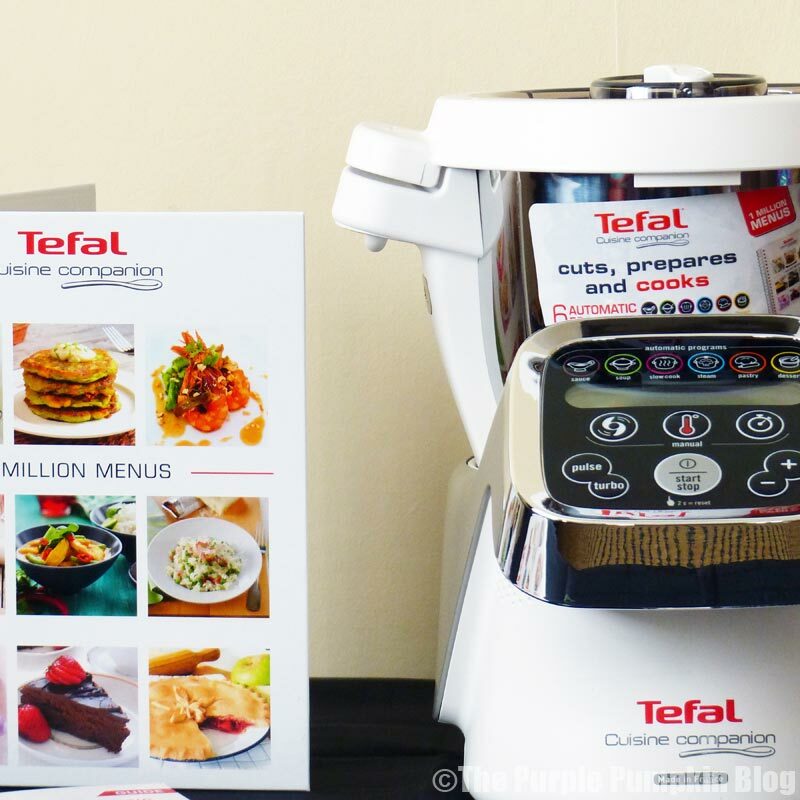 Disclosure: We were provided with the Tefal Cuisine Companion to review. All thoughts are our own. The OptiGrill is fab. This gadget is quite the investment piece. Definitely one for a wish list I think! I think that this is something that I might get quite a lot of use from, especially as I love my slow cooker. I don’t see it completely replacing my slow cooker, as I often cook some casseroles for 8+ hours! This has a max 2 hour setting. For “quick” casseroles this is great. What an amazing bit of kit for the kitchen! I hope you continue to experiment with its many & varied uses. Hope to report back soon with more findings! I don’t usually care that much about kitchen gadgets but this looks really cool! Being easy to clean is definitely up there on my list of things I look for in a small appliance. Without a doubt. The juicer we had was not only a mare to use, but so much taking apart to clean it after!! Wow it’s quite pricey but I love that it does so much and our kitchen is quite small so it would be great to be able to just have one gadget out. Look forward to hearing more about how you get on with it. Definitely on the pricier side, but it does seem to do so much. Great for people just starting out with their kitchen, and who haven’t bought ALL the gadgets yet! Hope to report back soon how we get on. I am very much someone who has bought gadgets in the past and not used them!! I think the only one we have used consistently has been the slow cooker… but we recently invested in a food processor and blender (both with 1000 watt motors) and my husband uses them almost daily, so he’s much more of a gadget king than I am a gadget queen ;) This new gadget intrigues me, but I do wonder whether it’s an investment we’d need at this point in our lives! I think so many of us probably are!! It is quite the investment piece of kit. I am looking forward to using it more to see how much we need it in our lives. I think with summer approaching (and good weather too I hope!) that we’ll be entertaining more so I would use it more for that sort of thing.